SPX makes an all time high on Tuesday, consolidates, then ends the week at 1760 another all time high. For the week the SPX/DOW gained 1.0%, the NDX/NAZ gained 0.8%, and the DJ World index was 0.4% higher. Economic reporting for the week was almost back to normal, and positive reports edged out negative ones. On the uptick: export/import prices, durable goods orders, wholesale inventories, the FHFA, plus both weekly jobless claims and the unemployment rate improved. On the downtick: existing home sales, monthly payrolls, consumer sentiment, the M1-multiplier and the WLEI. Next week we get a plethora of economic reports along with the FOMC meeting. Best to your week! 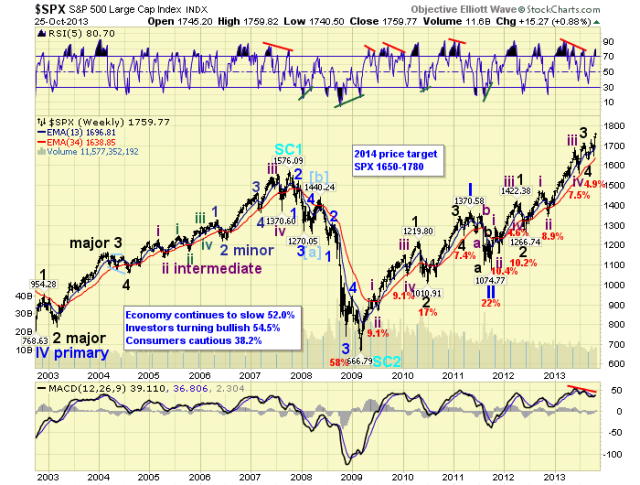 When this bull market began in 2009 at SPX 667, Primary wave I reached a high of SPX 1371 in 2011. During that advance Major wave 1 was the strongest at 553 pts., and Major waves 3 through 5 only accounted for a total of 360 pts. : about a 0.618 relationship to Major wave 1. During the current Primary wave III the internal waves have shifted to a more normal configuration. Major wave 1 was 347 pts., and Major wave 3 (at SPX 1710) was 443 pts, and Major wave 5 is currently underway. Notice Primary I displayed a strong Major 1, a good Major 3, and a weak Major 5. Primary III, however, is displaying a good Major 1, a stronger Major 3, and probably another weak Major 5. Fifth waves, and fourth waves for that matter, have been relatively small during this bull market. All second waves, however, have been fairly steep. These are this bull market’s characteristics. What this suggests, is that when Primary waves III and IV conclude we would expect Primary wave V to be relatively weak. Maybe just enough to post a new an all time new high, and likely without any trend changes either. Just one uptrend and done. Keep this in mind as the bull market continues to unfold. 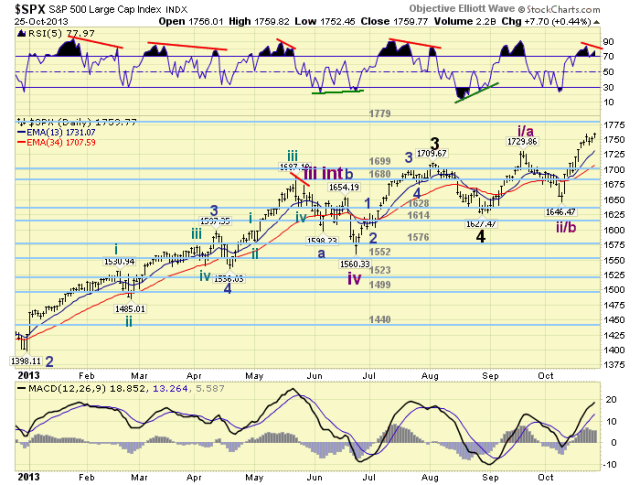 We have been counting this uptrend in the SPX from the late August Major wave 4 low at 1627. The first rally to SPX 1730 we labeled Int. wave i/a, pullback to SPX 1646 Int. wave ii/b, and currently the market is advancing in wave Int. iii/c. As noted last week, if Int. wave iii breaks above the OEW 1779 pivot, then Int. iv is not likely to overlap SPX 1730. If it does not, then an overlap is expected and it would be counted as Int. wave d of a Major wave 5 ending diagonal. 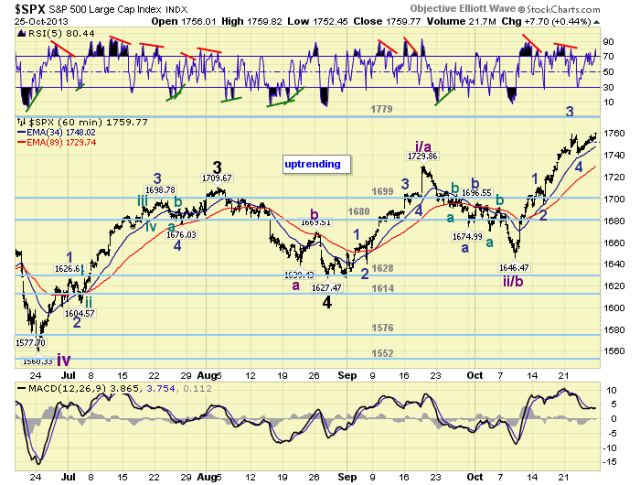 Then wave e should take the SPX to new highs to complete the uptrend, and completing the wedge. The OEW 1779 pivot appears to be the key. Currently Int. iii/c has already risen 114 pts., while Int. i/a rose a lesser 103 pts. Yet, even with the third wave being longer than the first, wave two was so steep that only a very shallow sideways fourth wave can avoid the overlap. Also of note, as we approach the FOMC meeting this week, there is a negative RSI divergence building on the daily chart. This could clear with another sharp rally like the first wave. But it is something to keep an eye on, as Int iii/c appears to be in its fifth wave. Medium term support is at the 1699 and 1680 pivots, with resistance at the 1779 pivot. This Int. wave iii/c advance has been fairly uniform: Minor 1 SPX 1712, Minor 2 SPX 1696, Minor 3 SPX 1759, Minor 4 SPX 1741, and Minor 5 underway to 1760 so far. Of note, Minor 3 was three points shorter than the 66 point Minor 1. And, both Minor waves 2 and 4 were nearly equal: 16 pts. and 17 pts. respectively. Some levels to watch going into next week. At SPX 1780 Minor 5 equals 0.618 Minor 3, and at SPX 1782 Minor 5 equals 0.618 Minor 1. With these level both within the OEW 1779 pivot range, there is a good possibility Int. wave iii/c will end in the pivot range. Should the market break through the pivot, the next level is SPX 1804, when Minor 5 equals either Minor wave 3. Short term support is at SPX 1759 and SPX 1730, with resistance at the 1779 pivot and SPX 1804. Short term momentum ended the week quite overbought. The short term OEW charts remains positive from SPX 1696 with the reversal level now SPX 1748. Best to your trading this busy FOMC week! The Asian markets were mostly lower on the week for a net loss of 1.0%. The European markets were mixed but gained 0.4%. The Commodity equity group were mixed losing 0.6%. The DJ World index continues to uptrend and gained 0.4%. Bonds continue to uptrend gaining 0.4% on the week. Crude continues to downtrend losing 2.9% on the week. Gold continues to push higher gaining 2.8% on the week. The USD is still down trending and lost 0.5% on the week. Monday: Industrial production at 9:15, then Pending home sales at 10AM. Tuesday: Retail sales and the PPI at 8:30, Case-Shiller at 9AM, then Business inventories and Consumer confidence at 10AM. Wednesday: ADP at 8:15, Q3 GDP and the CPI at 8:30, then the FOMC statement after 2PM. Thursday: weekly Jobless claims, Personal income/spending and PCE prices at 8:30, then the Chicago PMI at 10AM. Friday: ISM manufacturing and Construction spending at 10AM, along with monthly Auto sales. The FED has nothing scheduled except the FOMC meeting. Best to your weekend and week!